Beaver Problem? Beavercone - Stop Beavers from plugging your culverts. USE ONLY THE ORIGINAL PATENTED BEAVERCONE! BEWARE OF CHEAP BOLT TOGETHER KNOCK-OFFS! Designed to promote the free flow of water and the passage of fish. Installed properly it is almost impossible for a beaver to plug this device, no ice ups. If a cone ever gets damaged it is easily repaired on site. Cut out damaged bars and weld in new. If a road is shut down it only takes 15 minutes to remove the cone. The cones stack together, cones lift for cleaning. 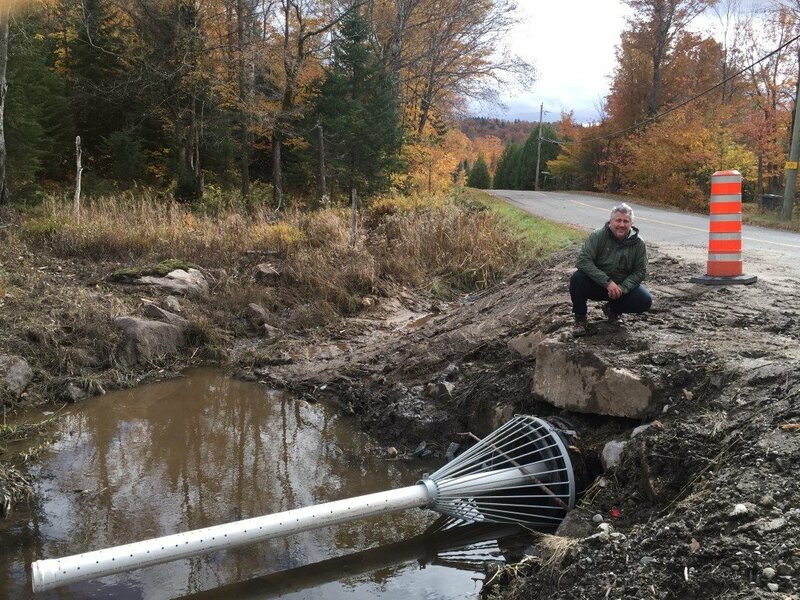 There is no other culvert device on the market that can make these claims. 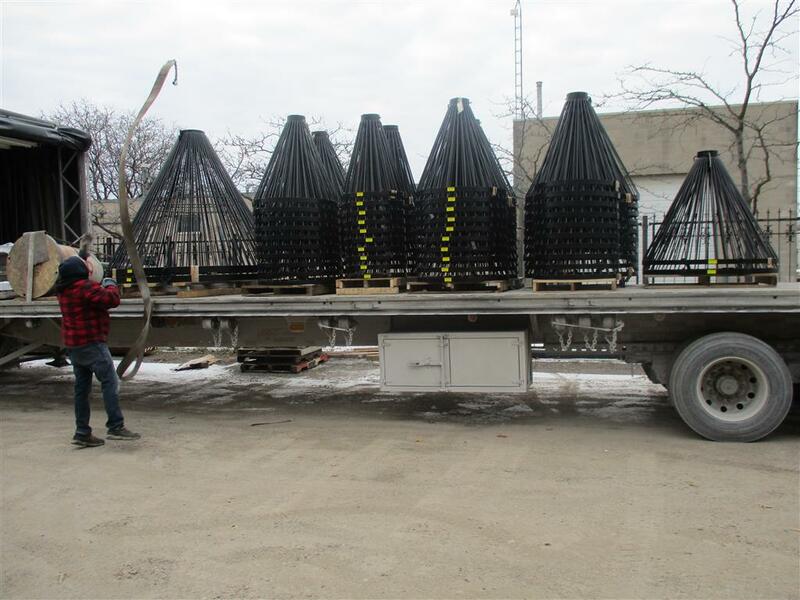 On smaller sizes, we recommend a perforated inner liner pipe as shown under product pictures. Excavate a small hole in front of the culvert. 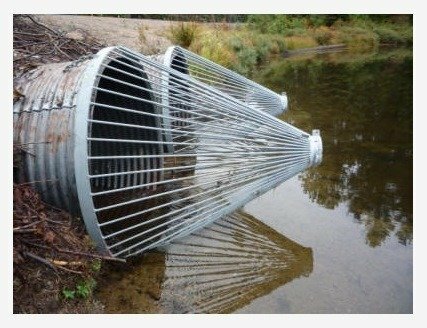 One length of perforated steel or hard plastic pipe (holes down) inserted through the cone and about one foot into the culvert to hold the 6” pipe level with the water, push a piece of 2 x 4 wood through the cone bars at the culvert over the 6” pipe. In remote areas we recommend this on all cones and put in a larger perforated pipe to fit the cone. 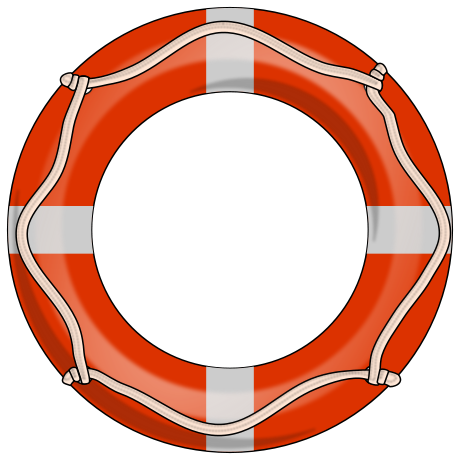 The Beavercone becomes a life preserver if someone (especially a child) falls into fast moving water. 82 Beavercones delivered to The Pas, Manitoba for the flooded out Hudson Bay Railway re-opening.